"Party of 8, your PartyPack™ is ready"
McCourt Manufacturing’s PartyPack™ makes setting up and tearing down weddings, anniversaries and other celebrations a piece of cake! Our pedestal tables can be used as bar height pub tables or as table-height convenience tables. Store and transport 8 knockdown pedestal tables on the innovative Party Cart. You'll appreciate the convenience. 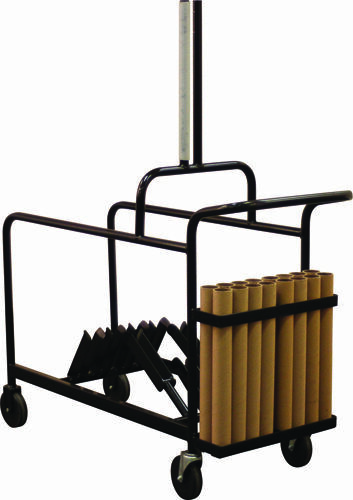 The Party Cart makes the most of your investment, protecting your tables from dings and drops. The narrow 22" width of the cart fits through any doorway and it's large 6" casters make maneuvering easy, even on outdoor terrain! 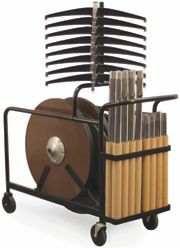 The Party Cart is bundled with 8 ProRent Pedestal Tables, either 30” or 36” in diameter, for an easy one-stop-Party Pack™. Heavy duty construction provides years of service in the daily use of event rental industries. Standard ProRent table tops are 3/4" plywood with PolyCoat finish and black Vinyl T-mold edging. Options include adjustable columns, aluminum SuperEdge and Laminate table top surface. Made in the USA with high quality materials and craftsmanship. 8 Pedestal tables and storage/transport cart. Make moving, set-up, tear-down and storage of your tables and chairs easy. Heavy-duty construction provides years of service in the daily use of event rental, convention center and hospitality industries.